Portland, the capital of the state of Oregon, is quite popular for its natural trails, parks and everything that a nature lover will wish for. It can easily be the ideal place to live in for those who want to be closer to nature. Did you know the name Portland was decided by the flip of a coin? Had it been otherwise, the name of the capital of Oregon state would have been Boston!! You can add to this so many other interesting facts that make it all the more worthwhile to visit this city. We compiled a list of 20 things you can do when you are in Portland, Oregon. This list is a random one, and in no particular order, feel free to choose what you like. Read on to find out more. The Heathman Hotel - Lodging For The Famous And You Too! Are you someone who is interested in artefacts that cover the science and technology field? Want something to challenge your brain power – OMSI is the place to be. There is something for everyone, whatever the age group. There is a planetarium which will fascinate kids and adults alike; then you can take the opportunity to have a look into the USS BlueBack or even the Empirical Theatre. Museum tickets start at USD 13 per pax, there are several packages available, so check it online on the museum website beforehand. One of the most interesting places to visit in Portland, Oregon. More than just a garden, the Lan Su Chinese Garden brings together Chinese culture, art, design under one roof. 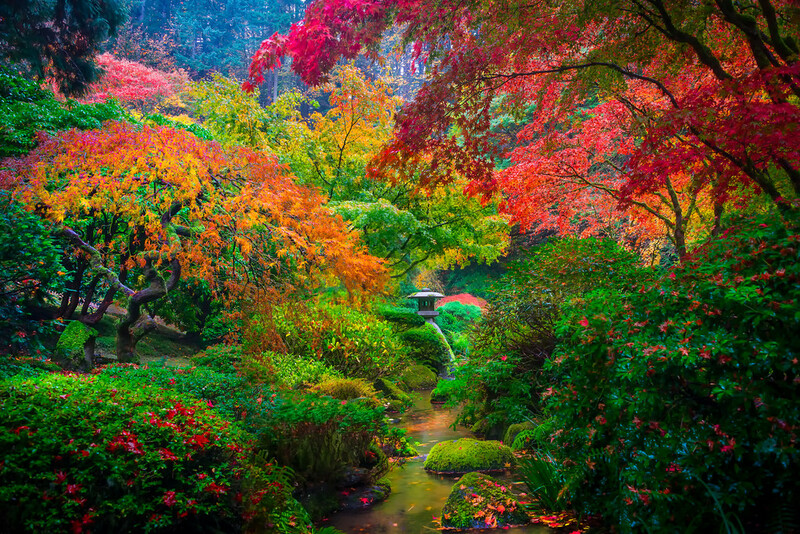 As you enter this garden, you might imagine yourself to be lost somewhere in China; such is the beauty of the garden. You can take part in various creative activities conducted in the garden – things you can learn include Chinese paper cutting, Floral arrangement, learn about plants to name a few activities. The entry is free for members; non-members can buy tickets from USD 9.50 per person. It is advised to purchase tickets online rather than waiting in the long queues because there is always something special going on at Lan Su. Looking for an urban public park for the residents and the general public of Portland, Oregon? You must head to the Washington Park. The park includes a zoo, a children’s museum, rose garden, forestry museum, memorials, archery range, picnic areas, and play area for children in the vast area of land. It is totally worth a trip, especially for nature lovers. This park has over the years become a community hub containing some of the most popular tourist attractions of Portland. The Oregon Zoo offers many kid-friendly activities apart from the regular animal exhibits. There is a zoo train, a petting zoo that we are sure kids will totally adore, sculpture garden apart from the natural play areas for children. Entry tickets are applicable for non-members, around USD 11.50 for adults, USD 10 for senior citizens, etc. Do check out the website before making a trip, and you could get yourself some good discount! Love hiking? Then Forest Park is a must visit for you when you are in Portland. There are umpteen numbers of trails here in this park; you can pick and choose which trail you wish to follow for your hike. You can choose to cycle or horseback ride on certain trails – just make sure you are on the right one. Some of the moderately rated (regarding toughness) trails include Lower Maple trail loop; Ridge trail; Nature and Chestnut trail loop. Another green spot for nature lovers – this time you can enjoy the Japanese theme of this garden. There is something or the other happening at this place, be it photography lessons or about horticulture or Japan’s nature story. It is easier to get to know what is happening and when if you enrol yourself as a member of this community. Inside Washington Park, you have some fantastic activities for children. One of it is the Children’s Museum. This is one museum that has creative as well as educational activities for children. There are several permanent exhibits, some of which includes the Twilight trail, the Clay Studio. These could be activities which every child will thoroughly enjoy. It pays to be a member of such a not-for-profit organisation, that can help in every which way. Highly recommended! A public park that most people in Portland use for walking, running, biking, jogging, basketball and such activities. A lot of “festivals” such as the Pride Festival, WaterBlues Festival, Oregon Brewers Festival take place here. A visit during the Cherry Blossom season is highly recommended. Portland is just awe-inspiring, with its green spaces, outdoor activities available and fresh air. Must go! One of the small amusement parks but one of the oldest in Portland. There are a lot of different rides at the amusement park; each one has its own entry ticket. Check the website for deals and packages before heading there. The roller skate rinks are highly recommended by locals who have visited this place. A must-visit for those coming in from other states and what a fantastic amusement park it is! A fantastic place for people who are interested in ceramics and crafts to visiting. Visitors recommend this place for the great atmosphere and friendly staff. The contemporary art and craft that is featured include some world-renowned artists’work. This museum is open only on certain days of the week, advisable to check before you make plans. General admission rates come to around USD6 per person. Rhododendron is a botanical garden located in southern Portland. Open every day, an admission charge of USD 4 applies from March to Labour Day and is free from Labour Day until the end of February! Highly recommended place to visit, especially if you are a nature lover and a keen botanist. A green space in the middle of the city? Yes, that is what you can see in Portland’s Park Blocks. You can also find the Portland Farmer’s Market apart from the meeting ground for students, an outdoor study place and some space for arts related events. Paul Bunyan was a mythical wood logger in the whole of the USA. You can find enormous statues of this mythical character and the most famous one is located in Portland. Get yourself photographed with Paul Bunyan for a picture with history. This one is for the movie addicts and an experience to be “consumed”. A theatre owned by a not-for-profit organisation whose sole aim is to entertain, educate, inspire and thus connect people through art of cinema. The shows are a good mix of new releases and old classics thus attracting people from all walks of life. If you want to experience what it is to sit and watch a movie in a “Hollywood” style theatre, this is the place to be. Oh and people who have been here vouch for the popcorn that is available at the café to be one of the best! Wish to be on top of an extinct volcano? Rocky Butte is said to be the volcanic cone of the “Boring Lava Field”. If you are in Portland, don’t miss it. The Rocky Butte is a favorite rock climbing spot for rock-climbers. It also has an unmarked hiking trail; sounds exciting ain’t it? The site offers stunning views from the top, a visit on a clear day especially late afternoon is recommended. This is because you can get to see the views as well as enjoy the wonderful sunset towards the evening. This way, you can experience best of both the worlds - isn’t that an awesome recommendation? Another not-for-profit organisation, some of the museum’s collections date back to the 1930s. The collections include fossils, fluorescent minerals, meteorites and a vast variety of minerals. A favourite with school children, this museum receives about 25000 visitors annually. Some of the gemstone collections include rubies, diamonds, opal, emerald and amethyst, to name a few. The historic musical venue is popular for the dance nights, especially the 80s dance nights organised quite often. Quite a few popular artists perform here as well. You can always catch your favourite bands playing. This visit is recommended because of the historic importance of the Crystal Ballroom. Dance events charge a nominal USD 6 per person as entry fee, which we think is very much warranted for the amazing experience you get over there. Looking for some fast-paced action? Then head to the Portland International Raceway – here you can learn to race, know how to get your car on the track and get a feel for what it is like to be in a race. You could even hold an event at the raceway. There are several events happening from time to time, so keep an eye out for the announcements! If you love to collect, preserve and exhibit, you must head over to the Oregon Historical Society Museum. If you love history, any history, this is the place to be. There is an enormous information reserve in this museum – you can even find out about the early Chinese settlers. There are records of some of the first few people who moved to the USA from China. We are sure you will find yourself immersed in whatever the museum has to offer. An amazing collection to say the least. You can choose to be a member and get yourself involved in the many activities conducted by them. The museum is open on all days, while the library attached, is open only from Tuesday to Saturday, so check and plan ahead. Ok, for the shopping addicts, we have a surprise for you – Portland is one of the places that you can shop without paying sales tax! Woohoo doesn’t that sound exciting? So what can you shop for here? Handmade items, designer goods, you name it, it is ALL tax-free! This one reason is enough to call out to all tourists (or so we think!) Come one, tell us isn’t this reason enough to make a visit to this place? Ah, we can hear some ayes!! So what are you waiting for? Pack your bags and head here soon! This Aquatic Park is entirely an indoor park. There are six swimming pools, which includes a wave pool, a zero-entry pool that is perfect for kids. There is also an adult lap pool. For those who may be interested in rock climbing, worry not, there is something for you as well -a 29-foot rock climbing wall. Entry fees apply – check the family rates before you head there – costs about USD 12 for residents. Tube rentals at USD1, they even offer 3-month passes for different age groups. Choose accordingly and have a whale of a time! So we hope you will now be convinced to make a trip to Portland, Oregon if you already haven’t been there. There is just so much to enjoy, and if you have already been there, have you ticked off all these activities? If you haven’t yet, we suggest you go there once again and finish off all the places to visit on this list. New to Portland, wondering where to start – feel free to start off with our list, the recommendations are in no particular order. We hope we have covered all areas of interest. Portland is such an attractive town, the places of interest are not limited to 20, there is so much more you can do, we hope to bring in much more interesting stuff to you!